These little cups are not only adorable, but easy to make. You can make the compote several days in advance and store it in the fridge. (This also makes an amazing topping for sandwiches, or plain chicken breast.) Once you construct them, however, be sure to eat them within 3 hours, or the phyllo dough will begin to lose its crispy crunch. 1. Preheat oven to 325° F, and spray a mini cupcake pan with cooking spray. Layer 4 sheets of phyllo dough on top of each other. 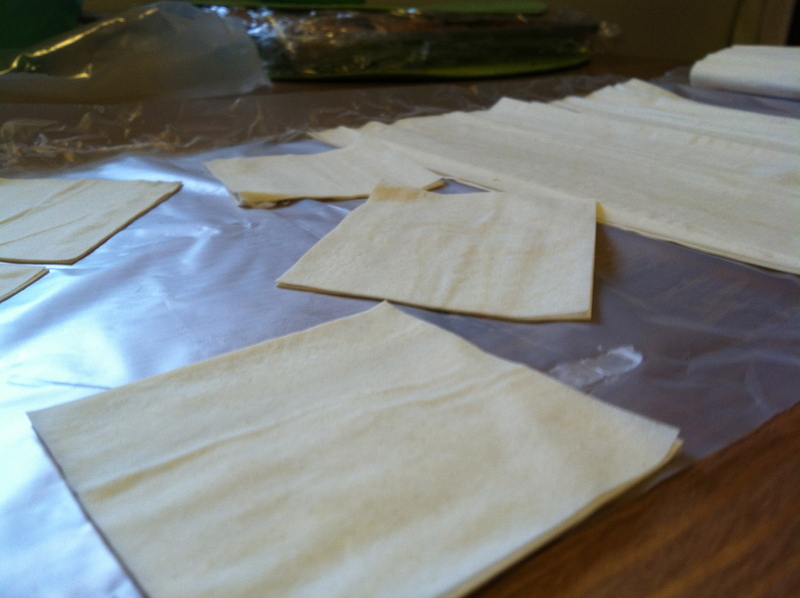 Working quickly to avoid drying it out, cut the phyllo into 12 rectangles, approximately 3.5 x 4 inches. 2. 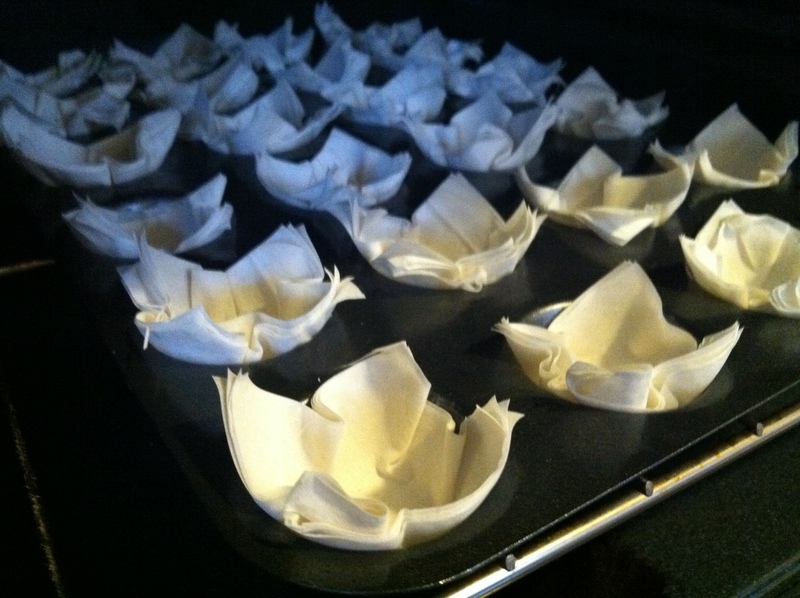 Stuff each mini cupcake cup with the phyllo rectangles. The edges of the dough will stick up above the rim of each cup. 3. Bake until the cups are golden brown, about 8-10 minutes. Let them cool on a wire rack in the cups until they’ve reached room temperature. 4. While the cups are baking, combine the peeled and diced apple, fig butter, cinnamon and brown sugar in a medium sauce pan over medium heat. Cook, stirring occasionally until the mixture thickens and the apples are soft when pierced with a knife. Set aside and let this cool to room temperature as well. 5. While you wait for everything to cool, combine the goat cheese, cream cheese and milk in a bowl and beat with an electric mixer until smooth. Refrigerate until ready to use. 6. Once everything has cooled, spoon some of the goat cheese mixture into each cup, filling it about half way. 7. 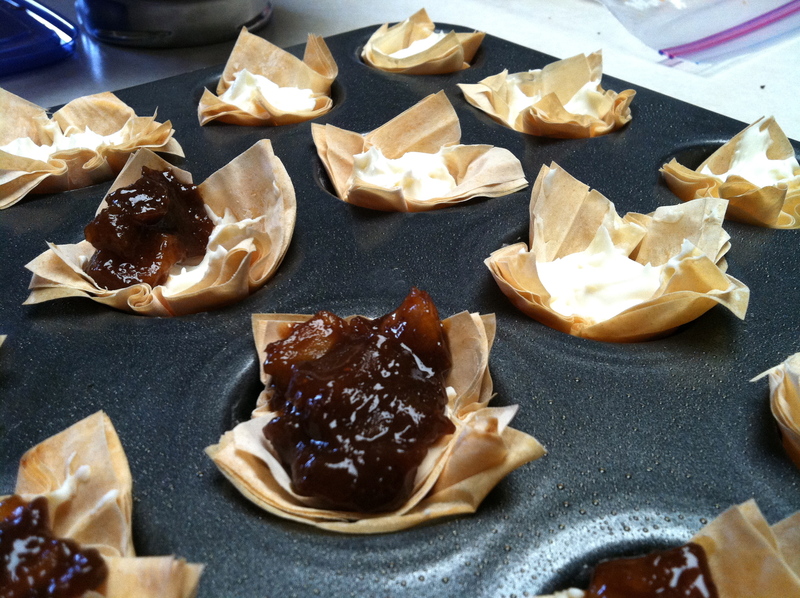 Top the goat cheese with the apple-fig compote filling the cup to the edge. Serve immediately and enjoy your bites of tangy, fruity deliciousness! 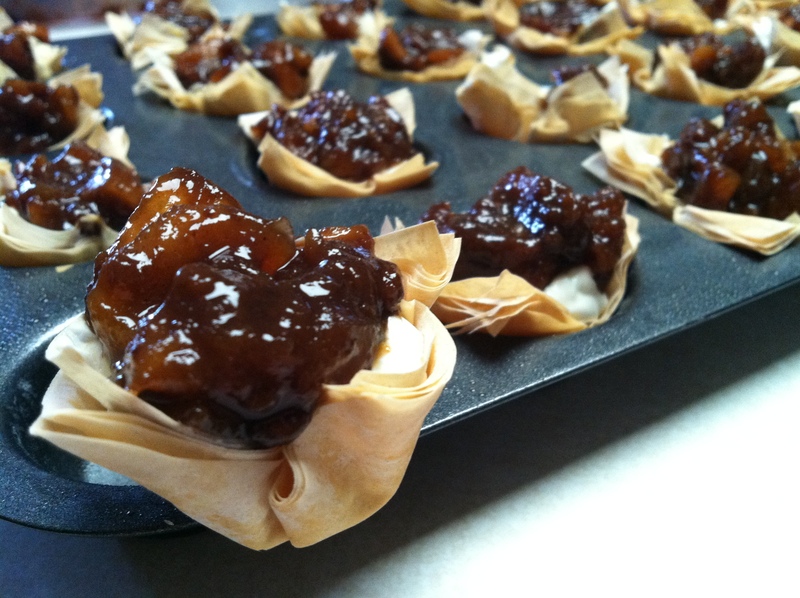 This entry was posted in Uncategorized and tagged appetizers, apple, Fig, Goat cheese, mini treats, Party Food, phyllo by theculinarycapers. Bookmark the permalink. I’m glad you liked them! 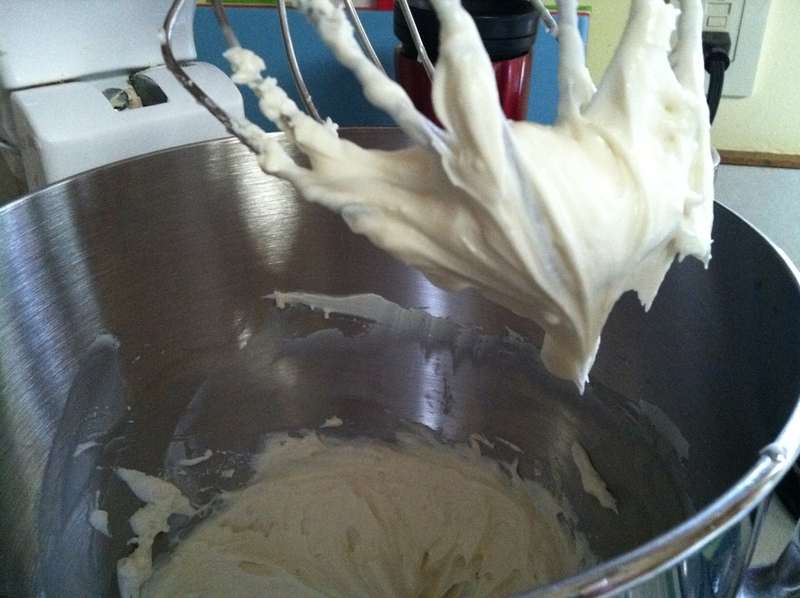 I’ve still got left over phyllo dough to use up, so you might be seeing them again! 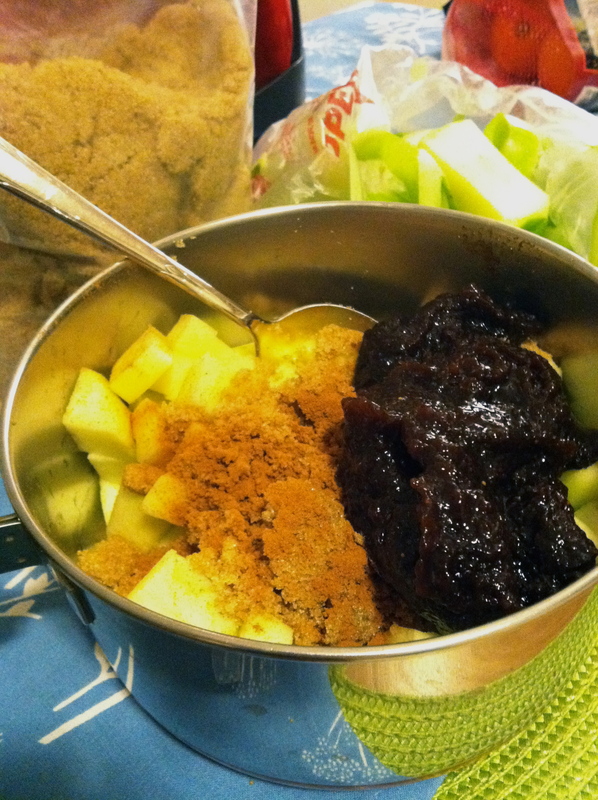 While I wasn’t smitten with the goat cheese but I did LOVE LOVE LOVE the apple-fig compote! I’m glad you loved at least half of it! That compote would also be awesome on pancakes. Or even chicken. I was thinking pork roast or pork chops. Can you imagine how good that would be? Omg, It would be amazing on latkes too! Actually that compote really was a standout now that I think about it. Yes! Pork tenderloin, that’s so what I’m using it on next.